Your heating system is a vital part of keeping you comfortable throughout the winter. When the weather outside gets cold, you want to know that your home will remain comfortable inside without costing you a fortune in energy bills. Routine maintenance is one way to ensure that your heater is running efficiently and that it is tuned–up and ready for winter. 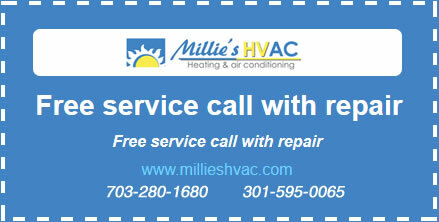 For heating maintenance services in Ashburn, VA, call Millie’s Heating & Air Conditioning. We also offer maintenance programs to fit your heating needs and your budget. Our qualified technicians service all makes and models, and even if we didn’t install your heating system for you, we’ll maintain your system to keep it performing well for the life of the system. Call Millie’s HVAC any time to schedule an appointment. If you have recently installed one of the many high–efficiency heating systems on the market today, the first step is to make sure you know how to maintain it. The next step is to call Millie’s Heating & Air Conditioning before each heating season to schedule a yearly tune–up. Even a brand new system will need regular professional maintenance to keep it running as efficiently as possible for its intended lifespan. Whether you have a furnace, heat pump, packaged system, split central system, or ductless split system, we can maintain it for you. problems with your heating system, call Millie’s HVAC . We provide same day, priority service to all of our Comfort Assurance members, and there’s never any overtime charges. Call now if you have an urgent repair need! Whatever your heating maintenance needs are, call the experts at Millie’s Heating & Air Conditioning. We proudly provide service to Ashburn, VA and the surrounding areas. Contact one of our friendly team members any time to make an appointment.